Size: Various sizes. Please see below. High performance bespoke timber acoustic doorsets. These high quality soundproofed doors are available in a wide range of veneer finishes and are fire resistant. Suitable for areas requiring a higher than normal degree of sound insulation and can be used in studios, schools, offices and a wide range of other places where sound control is required through any doorway. Specialised bespoke wooden veneered acoustic doorsets and soundproof doors for all types of internal applications where a degree of sound control is required. Acoustic doors are extremely high performance sound reducing doorsets. These top quality soundproofed doors are available in either veneered or painted finish and are fire rated. These acoustic doors are used in areas which require high sound reduction performance such as radio/TV studios, music rooms, interview rooms, cinemas etc. These single and double acoustic internal doorsets are fire rated and available in a wide range of wood and laminate finishes. They are used wherever high sound reduction performance is required between noise sensitive areas such as in private offices and consulting rooms. Veneers: Standard veneers can be seen on the tech spec page above. Others on request. Note: The term ‘doorset’ on this page refers to complete assemblies (including frame, seals, threshold, doorleaf and hinges). 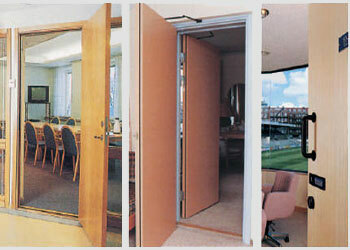 To achieve the optimum fire and acoustic performance, the acoustic doors must be supplied and fitted as complete. PLEASE SEE FULL DOOR DIAGRAMS, FURTHER DETAILS & VENEER FINISHES ON OUR TECH SPEC PAGE. We Require A Disclosure Form Faxed To Us Before We Can Complete Any Order. This Can Be Found Above.